Do you love bell peppers, onion and beef? 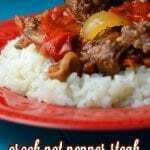 This Crock Pot Pepper Steak recipe is the recipe for you! Put your roast in your crock pot and sprinkle with flour and pepper. Stir well to coat your meat. Add the rest of your ingredients except for your rice. Reduce your heat to low and cook for another 8 hours.